Here’s a new take on just about every American’s favorite lunch box/after school/secret midnight/raw dough sneaking snack. 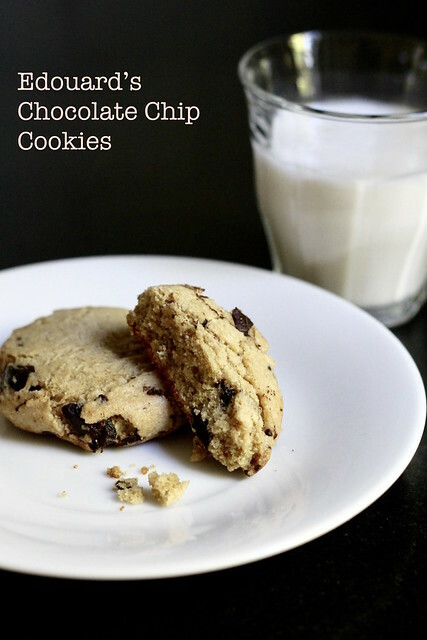 French-up Chocolate Chip Cookies like Edouard does with a little almond flour. You get a soft, chubby cookie, but the taste of nuts is not forefront. I like these best still a little warm from the oven, and I think I’ll sprinkle a little extra salt on the tops of the next round I bake off (I have a lot of dough scoops in the freezer.). Dough scoops in the freezer is the absolute BEST thing!! Weren’t these good? I agree – these were delicious. The extra salt on top sounds like a great idea. They do look cute and chubby. A sprinkle of salt sounds like a good idea. We really liked these too. I think they are my new favorite cookie. That’s the perfect crumb on those, Steph – yum! Everyone’s favorite cookie..I wish i could bake this up with same perfection!! Tried once and it came out so hard and sticky!